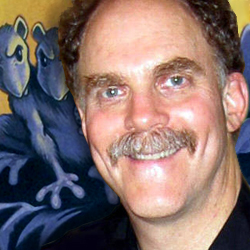 David Fox, one of the mainstays of the LucasArts adventure games, can be considered responsible for what's the particular style of those games. We could chat with him about the genre and his experience at Skywalker Ranch, as you're about to read. Aventura y CÍA: Many years have passed since you made your last contribution to the adventure world with Obsidian, and even more since you left the Skywalker Ranch. What has become of David Fox since then? After LiveWorld, I re-entered the game industry for a while and worked on an amazing Location Based Entertainment project at Xulu Entertainment. Unfortunately, that company went out of business, but you can still go to its Web site and see some of what we were working on. And for the past 6 months, I’ve been volunteering on the Howard Dean for President campaign, doing video production, creating Web sites, and more. Check out Switch2Dean.com and WinningBackAmerica.co ... and at least one of these Switch ads is being shown this week on TV by the Dean campaign. Overall, I’m looking for projects that make a difference on the planet, especially ones dealing with social activism, or personal empowerment. Quite a change from the games I worked on in the 80s! AyC: Let’s take a look at the past: in 1982, you started working in a then unknown game company, along with a very limited crew. At first, you started designing (together with your partners) games that would become forerunners of some of the bigger advances in the computer entertainment world, despite being only a few people working together behind them. Now the industry has grown, groups are bigger, budgets are huge and technology is rapidly going forward. However, today’s games (nostalgia apart) are not just as funny as the ones back then. What is the formula to such an amusement, which nowadays no one seems to get? DF:Hah, well thanks! One thing that I loved about working at Lucasfilm Games/LucasArts Entertainment was that for a long time, we were given free reign to invent as we went along. We all liked writing comedy, and focused on the experience of the game, the story, characters, not the effects. Maybe because we had to - those computers were pretty weak by today’s standards, so there wasn’t much you could really do graphically. You had to leave a lot to the imagination. AyC:Even though you initially made games not strictly related to the adventure genre, later you were slowly getting into it. When you started working in LucasArts, were you eager to tell an interactive story or did you just want to make games that simply entertained people? DF:When I first got there, I think I mostly was in shock. I’d pinch myself and think, "Am I really working for George Lucas?" The kind of games I was most interested in creating were those that were truly immersive. I wanted people playing our games to feel they were "inside" them, much in the way I felt I was inside the Star Wars universe the first time I watched that movie. AyC: From the limited initial group of people that made up the game division of Lucasfilm to the big company that now is LucasArts, the corporation has indeed grown and many talented people have been part of its crew. What do you feel in the knowledge that part of the glory LucasArts has earned today is thanks to your talent (among many others’)? DF:I’m always thrilled when people send me email saying how much they liked one of my earlier games. It always reminds me of the best parts of being there during LucasArts’ first decade. At the beginning, we knew we might be a part of something very special. And over the years, felt the heavy responsibility of living up to the standards set by the Lucasfilm films. AyC: After ‘Rescue on Fractalus!’ in 1984, you continued your career in Lucasfilm and created an adventure game that did not strictly follow the standards back then. You could see the character in third person like in Roberta Williams’ King’s Quest, but it was controlled by menus, which pretty much simplified its interface. Back in those years, struggling to make the most comfortable interface must have been to the order of the day, but time has passed and interfaces have been much enhanced. Do you think they can still be improved or is it a waste of time to drop one’s efforts into this matter? DF:We felt that too many of the puzzles in the Sierra adventures (like King’s Quest) relied on acquiring skills with steering your character around the screen. Likewise, we didn’t want a game that was mostly "guess the parser" - trying to figure out what words the programmer was thinking of when he created the game. Neither process was fun, and they took you out of the game experience. So our attempts with a "slot machine" interface in Labyrinth was a first try to simplify coming up with the commands, and keep the player in the game.